Estrada, M., Lee, D., Murray, B., O’Sullivan, R., Penman, J., and Streck, C. 2014. “Land Use in a Future Climate Agreement.” Prepared with support from cooperative agreement # S-LMAQM-13-CA-1128 with U.S. Department of State. 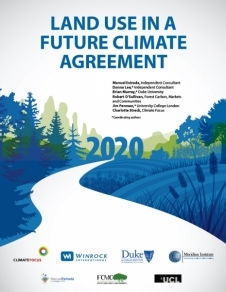 This report is in support of the ADP negotiations on a post-2020 agreement and focuses specifically on the role of emissions and removals from land use.